Open All Hours DVD complete collection. 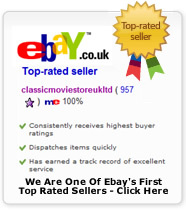 5 DVD's containing all 4 series plus the pilot of the hit comedy Open All Hours. Please note this is 4 separate dvd's in a bundle and not a box set. DELIVERED FREE IN THE UK when you spend over £15. For the next 4 days we have the following BBC TV series on a super promotion. 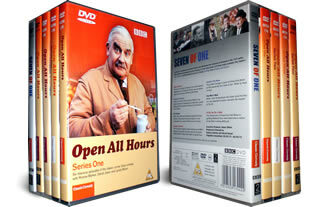 This 4 DVD set contains the Open All Hours complete series. Ronnie Barker plays Arkwright, the tight fisted stammering small shopkeeper, who would rather risk arm amputation than replace his death-trap of a till. David Jason (Only Fools and Horses fame) plays young Granville, Arkwright's ill-fated, over-worked, sexually-frustrated errand boy, while Lynda Baron is Nurse Gladys Emmanuel, the owner of an awesome bosom and an old Morris Minor and is the object of the grocer's undying lust. Please note we can also sell these dvd's individually for £6.99 each, please call 0208 123 1333. 4 DVD's delivered to your door. As expected, this DVD set met all expectations. Anything with Ronnie Barker in is good viewing.